I'll start with the Revlon Colorstay Whipped Creme Makeup, which I reviewed here. 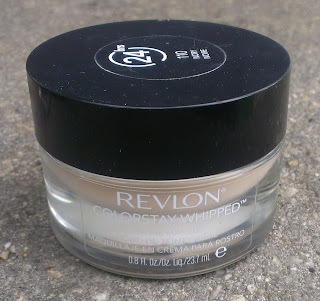 This is a drugstore foundation that really has it all going on - it's hydrating enough for dry skin, feels lightweight on the skin, offers really good coverage, has a beautiful natural finish and lasts for 10+ hours even in the summer heat. I have it in 110 Ivory and it's a pretty good match for my super fair skin. I highly, highly recommend this foundation especially if you have dry, normal or combo skin. 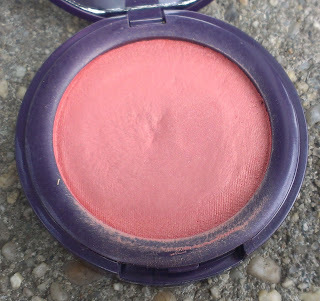 When it came to blush in August, I wore Tarte Airblush Maracuja Blush in Shimmering Peach to death. 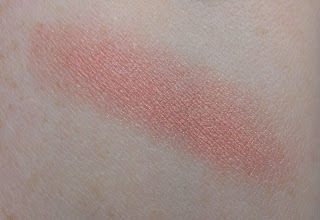 I mentioned this blush when I received my second shipment of the Tarte Miracle of Maracuja TSV from QVC - it's an interesting cream formula that has a drier texture than most cream products so it lasts longer on the skin. 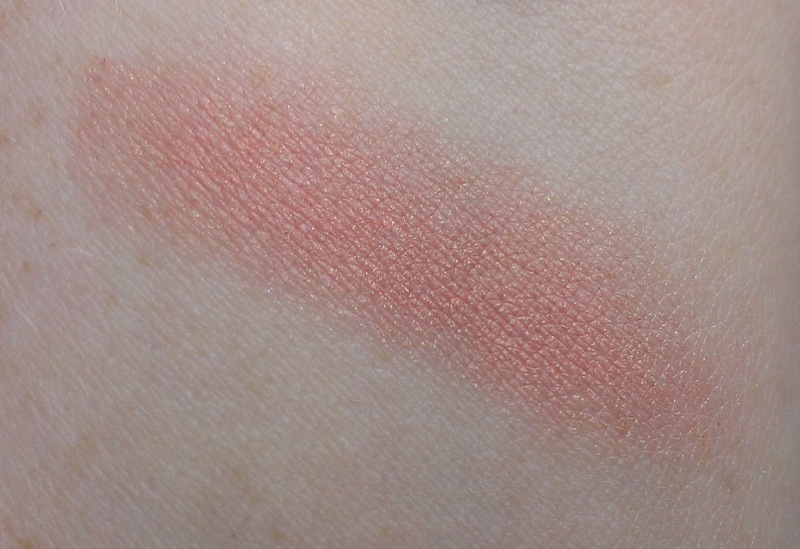 But it's really the color that gets me - a gorgeous, shimmery peach shade that looks so healthy and glowy on the skin. It may actually be my favorite cream blush at the moment. 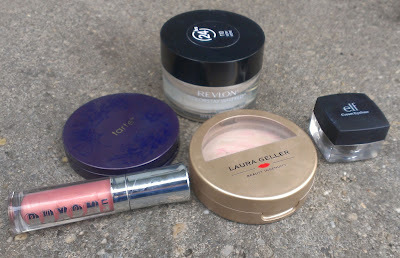 When I discussed the upcoming Laura Geller TSV, I mentioned that I've been loving the Balance-N-Brighten in Porcelain and it would probably turn up in my monthly favorites. Technically, it's a powder foundation and I do use it that way sometimes, but in August, I used it exclusively as a setting powder. The Porcelain shade is perfect for helping to color correct foundation that's slightly too dark or orange-y on my super fair skin. 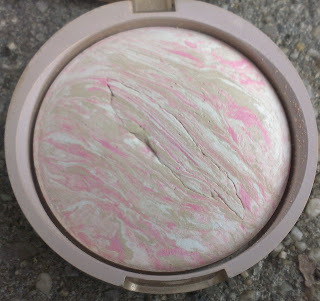 If you are super fair, the Porcelain shade is really perfect - as you can see above, it's one of those swirled products and there's plenty of pink running through it to balance out any yellow or peach undertones in liquid or cream foundations. 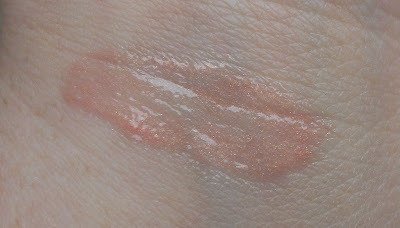 It's nice and lightweight too, so it doesn't look cakey on the skin. For those of you with darker skin, it comes in three other shades - Fair, Regular/Medium, and Tan - so there's probably an option that would work for you. Because e.l.f products are so inexpensive, there's a tendency to think that they can't really be any good. And while there are plenty of dud products in the line (as in any makeup line), there are some really standout items too - which are even more impressive when you consider how affordable they are. One of my favorite e.l.f. 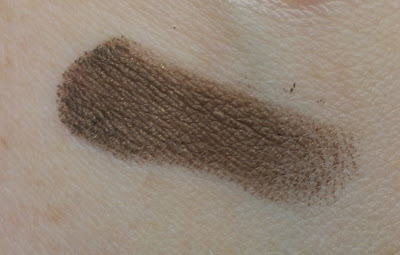 products is their cream eyeliner, which is only $3 but offers great pigmentation and long wear. This month, I got a new shade that I am absolutely in love with - Copper. It's a gorgeous warm golden-brown with just the right amount of shimmer. If you've got blue eyes, it's a particularly pretty shade, though I think it would flatter most eye colors. I also like using these cream liners as bases for a smoky eye and I love the copper for a pretty bronze look. For $3, it's pretty much a can't-miss product. Because I was playing around with my eye makeup so much this month, I kept wanting a nice light, simple lip color that wouldn't be too much with a heavy eye look. The Buxom Big & Healthy Lip Polish in Leslie totally fits the bill. It's fairly sheer, but it's perfect on its own if you're wearing a smoky eye or over a lipstick for some shimmery goodness. I am a huge fan of the Buxom glosses in general, so you can't really go wrong with any of them. Now, since I didn't have as many beauty favorites this month, I thought I'd throw in a couple of non-beauty related items for fun. When it comes to TV, my favorite show this month (really, all summer) was definitely MTV's Awkward. Now, I'm probably way too old to be so obsessed with a show about high school but this one hits all the right notes - it's funny, smart and sweet. And it's got that one special ingredient that all compelling shows, movies and books seem to have - a gut-wrenching love triangle. If you haven't seen it yet, you can watch all of the episodes for free on MTV's website. For music, I've been absolutely obsessed with Alexz Johnson's Stepping Stone EP. I'm not ashamed to admit that I was a big fan of Instant Star, so I've always been in love with her amazing voice and this EP totally does it justice. The lyrics are pretty amazing too - my two favorite songs are Walking and Stepping Stone. Just gorgeous.